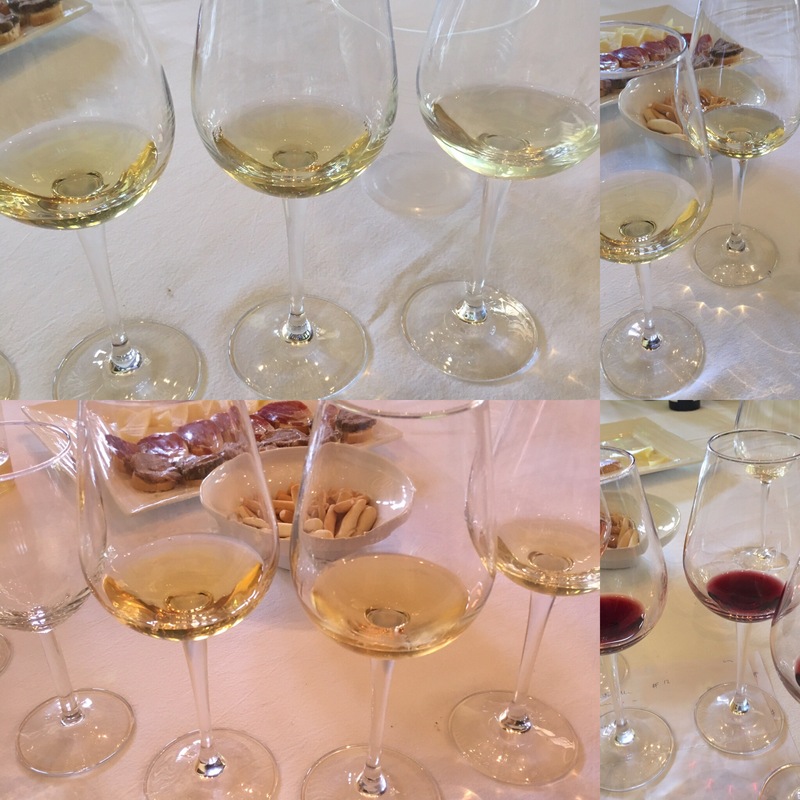 Wanted to jot down my thoughts and impressions of a fantastic tasting I did with Willy Perez last Friday in relation to a project I find fascinating (and a wine that I really love). As I have written about ad nauseam the Barajuela project is all about recovering the old school wines of Jerez that once ruled the world. This means big, concentrated wines with a clear identity quite distinct from the lighter “manzanilla” style of current wines. It means low yields, later harvests in several passes (first for brandy, then fino, then oloroso) a short period of asoleo or sun drying to further boost concentration and a focus in the cellar on the wine rather than the flor or barrel effects. (For example, unlike many modern finos with pronounced acetaldehide profiles here efforts were made to keep a balance with the wine’s other characteristics – a balance that is achieved despite a very high level of acetaldehide.) The wines are also terroir and vintage specific and, since single vintage wines age quite differently to their solera counterparts, the back label seeks to recover the old school “palmas” system of classification. The tasting could be broken down into three sections, each a nice illustration of what the project is all about. First up, we had a run at the mostos from 2015, exploring the effects of the maturity of the grapes in the different “passes” at harvesting. We tasted the mosto for brandy, the greenest, least developed fruit, harvested in early to mid August, the mosto from grapes harvested two or three weeks later, and the mosto for the fino, from fruit harvested a week later still. There was a clear progression in aroma, weight and flavour in the three wines: more and more honeyed on the nose (the mosto de fino in particular had a lovely nose that reminded me of the “cojonudo” pastries you get in the mountains North of Madrid) and, quite apart from the growing strength and weight, more and more (extremely ripe) melon on the palate. Obviously there was a big step from the first mosto to the second, but it was amazing to see the step from second to third – the difference that that selection and one week of sunshine had made. Next up was an exploration of the effects of the flor on those mostos (not that much flor – these botas were filled more than usual). The fourth wine was a 2014 mosto de fino, followed by a bottle of the 2013 Fino la Barajuela and a 2013 Palma (roughly speaking, the 2013 fino with six or so more months under flor). Again, the steps between the wines were as instructive as the wines themselves: the 2014 mosto was extraordinary compared to its 2015 equivalent with a noticeably full and mineral mouthfeel – real power and zing to it- the 2013 Fino had that brilliant balance of concentrated fruit and mineral grunt and the Palma was just a touch sharper in both salinity and in the fruit flavour. I would find it very hard to choose between the two 2013s – would love to have tasted them blind – but since I was asked I reckon the fino was dead right, with enough fleshy juice to it despite all that power. (There may also have been some effect from its time in the bottle.) As for the 2014, my mouth is literally watering at the prospect of when that is ready. Then out came the lesser spotted 2013 Oloroso la Barajuela. This wine is from grapes harvested later still – important to remember this is a different wine from the same vines, not a continuation of the fino – and has another step up in concentration. Rather than under flor it has been “traditionally” aged (but not for very long, which I gather has been the source of some issues with the DO and the traditional classifications, hopefully soon to be resolved). The power and solidity of it is impressive – for now it just has an edge of burn and oxidation but you get a feeling that given time it will be capable of the most amazing full bodied, high register caramel flavours. No bones about it – it is an absolute beast. We didn’t in fact finish there, we also tried a 2014 pedro ximenez, an excellent mineral and refreshing 2015 Tintilla de Rota rosé and the 2015, 2014 and 2013 Tintilla de Rota reds, but by then my mind was wandering (I even left my notes behind before remembering just in time and dashing back in). It was a brilliant tasting in which I learned a lot, and even better with some really cracking wines and a few laughs thrown in. Blessed are the rulebreakers and long live the new old school.